Henriette Mantel is a comedian, actor, producer, director, and writer. She is not, however, a mother. And, despite popular opinion, that’s ok. 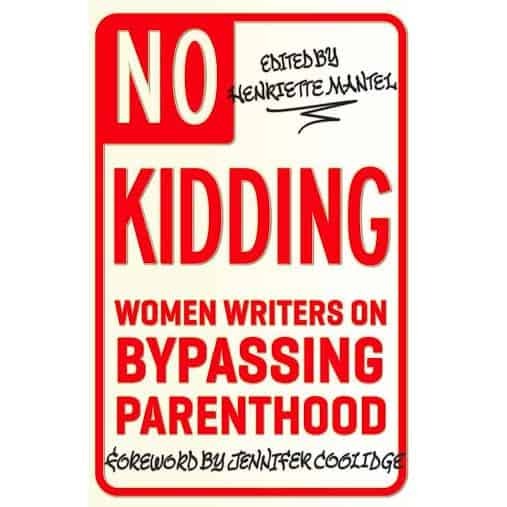 In No Kidding, Mantel has collected more than 30 stories from comedians, writers, and actors, including Margaret Cho, Wendy Liebman, Laurie Graff. Many are older, some are settled (or not), with partners (or not), funny women who–for a variety of reasons–opted out of motherhood. Some wanted to have children, but couldn’t. Others found that the opportunity never really presented itself; they didn’t find the right partner, faced fertility issues, were waiting for some mythical “right time,” or they simply had other life goals. Then there are those who, like me, never wanted children. Admit this, and it quickly becomes impossible to tune out the barrage of intrusive nonsense that comes from family, friends, and–with astonishing frequency–complete strangers: Do you have any children? How many children do you have? When are you having children? Have you frozen your eggs? You’re not getting any younger. Alarmist bunk about clocks ticking or winding down–personal stuff no one should have to discuss with their cab driver. As if that’s all women ought to be concerned about. Condescending know-it-alls insist that we’ll change our minds someday, or attempt to shame those who opt out into silence. Ugh. Read it if you’re someone who wants kids or has kids in order to understand the frustrations of your child-free friends. Read it if you’re child-free to relate and take comfort in the knowledge that you’re not alone. You’re totes normal, and yeah, still a woman, whatever you decide (not) to do.